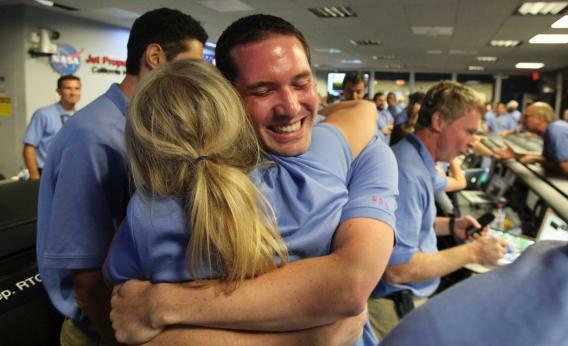 The one year of life of the Curiosity Rover on Mars has been a rollercoaster ride of emotion. We’ve gone from the white-knuckle tension and tears of joy of the NASA technicians in Pasadena when it landed in a crater on the red planet (and the insta-celebrity of one Mohawk Guy), to the existential pangs of watching an inanimate object celebrate its birthday all alone in the outer-reaches of our solar system. Curiosity has provided more than 190 gigabits of data; returned more than 36,700 full images and 35,000 thumbnail images; fired more than 75,000 laser shots to investigate the composition of targets; collected and analyzed sample material from two rocks; and driven more than one mile (1.6 kilometers). Yesterday NASA also released a video celebrating the anniversary of the landing. To make the Rover’s soil samples fall down into the Sample Analysis at Mars organic chemistry lab on board the Rover, NASA technicians at the Goddard Space Flight Center in Greenbelt, Md., programmed it to vibrate at different frequencies, making a recordable sound. On Aug. 5, they tried something special with that capability. As NASA technologist Florence Tan says in the video, if there’s anyone listening on Mars, on Monday they would have heard a very lonely Rover singing itself happy birthday.